Clean and all natural, the SeaKlear team at HaloSource combined their Natural Clarifier with extra natural enzymes to create this powerful Rescue Klear formula. It's made for pool emergencies, blended to fight the worst cases of scum and cloudy swimming pool water. Keep a bottle handy for the unforeseen circumstances that arise from wild weather, troublesome neighborhood vandals, crazy pool parties and more. 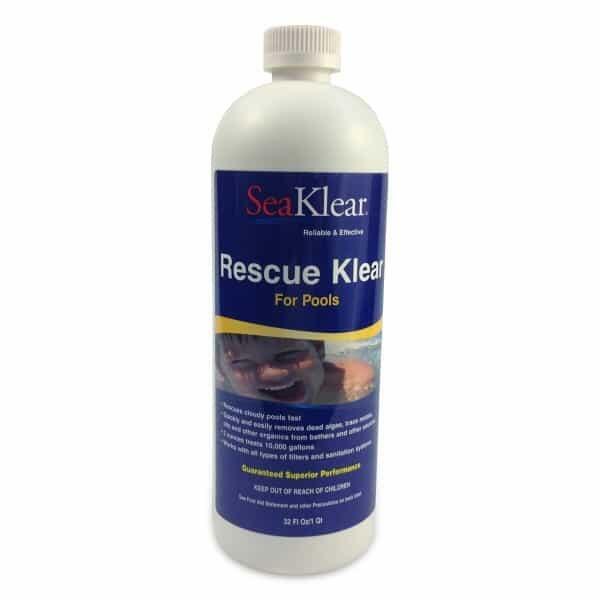 If you own a pool a powerful cleaner such as Rescue Klear is a must-own swimming pool supply. Gentle enough to be used for regular maintenance, yet powerful enough for quick large doses that will virtually zap away your pool problems, SeaKlear offers this solution made from crab shells and natural enzymes. All Family Leisure swimming pool products such as Rescue Klear by SeaKlear and HaloSource come with free shipping nationwide, from New York to California. Cloudy Water: Rescue Klear's natural formula degrades quickly and is designed to clean cloudy pool water faster than other pool products. Use two ounces of Rescue Klear for every 10,000 gallons of swimming pool water for simple cloudy water problems. Wait six to eight hours before you swim. For Serious Cloudy Water, Scum & Other Problems: Because of Rescue Klear's natural formula you can overdose a swimming pool in an enzyme shock to clean horrible water. HaloSource recommends starting with 32 ounces of this pool solution poured into the deep end and keep adding more doses until the problems are solved. The solution degrades fast and will filter out along with any scum, debris and dirt. Wait six to eight hours after the last dose before you swim.